In February 2007 I made a number of visits to the only 2 sites worldwide where it is possible to see the White-fronted Scops Owl. With this report I want to share my knowledge about finding this rare bird. 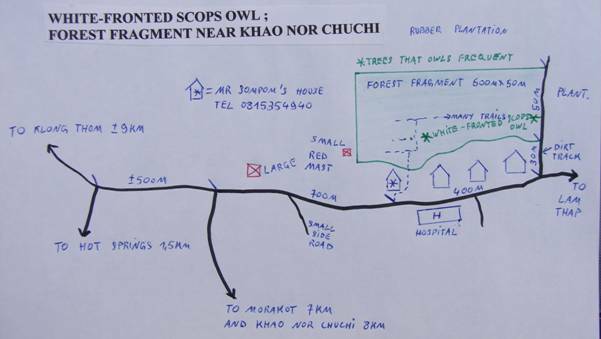 Having heard WFS Owl previously in May 2006 I decided it was about time to put in some serious effort and managed to see the Owls at both Kaeng Krachan NP during 15-19 February and the forest fragment close to Khao Nor Chuchi Wildlife Sanctuary on 25th and 26th February. I did saw the Owls 2 out of 3 nights at Kaeng Krachan and on both dates at KNC. It is listed as vulnerable in the red data book. It is endemic to the Thai-Malay peninsula where it occurs only in lowland or foothill forest that has been largely destroyed or degraded in its range. The call is a strange drumming that only has been recorded a few years back. It has not been described in the literature but I can tell you that they love tree-forks to sit/hide/nest? in, which is something to remember if you go try to see them. This is probably the best place to go with loads of good birds to see in the daytime while waiting for dark to arrive. Conveniently located close to Bangkok. You’ll find directions on the internet etc. Less attractive to some visitors however will be that you have to camp out and not to be afraid of walking in the dark with Elephants and Leopards at home in the park. I’ve never had any problems however and it is highly unlikely to run into some. Visiting KK without your own transport is not a problem really as far as the Owls concerned. They are at approx. 1,5 km walking from Bang Krang campsite. I saw White-fronted Scops Owl at the first stream crossing on the jeep-track leading up from Bang Krang camp. Got them both right before and after the stream next to the track. They started calling not before it was completely dark but then kept calling for hours. I didn’t had to, but you might need to play a few seconds tape to start them up. (Got them this way at KNC when things started off quiet) DO NOT overuse this as it is not good for the birds and they will NOT come in to tape so there is no need to keep playing. You might need to walk into the forest for a few metres to see them when they’re calling a bit more inside, be careful!!! White-fronted Scops Owl has been seen at the second stream crossing too. Probably these were the same pair of birds that is present at the first stream crossing stake-out, as it is only 300-400 m apart. Travellers to southern Thailand and KNC in particular can easily go visit this site only 7 km from Morakot resort, which is more than probably going to be your accommodation while birding (searching Gurney’s Pitta) at Khao Nor Chuchi. It’s just only a tiny bit of forest left in a sea of plantations. Nothing to be happy about but better than nothing and you can be sure the White-fronted Scops Owls will be inside as there’s nowhere else to go for them. With some perseverance it should not be too hard to find them here, if they’re calling. Best is to try first from the dirt track which runs right next to the forest. If nothing moves here or the owls are calling from more inside you might want to ask some help from Mr Sompom who knows the many trails inside (and the owls!). He lives in the house exactly 700m from the Morakot junction. (see map, tel 0815354940) He doesn’t charge anything but it’s appropriate to tip about 100 Baht a person if the owls were seen. Note that this patch of forest isn’t a reserve, is not protected and there’s no entrance fee. Directions : From Krabi go south for 40 km on HW 4 towards Trang until you reach Klong Thom where you should take the only turn off (left) the HW, towards Lam Thap. Take a right turn after only 200m on this road following signs for Hot Springs/Cristal Pool (Morakot-KNC). Just follow now and go straight past both Springs and Pool turnoff, with the forest fragment about 10km from Klong Thom and 7km from Morakot resort.